Aiming, focusing, and setup of cameras is a key consideration in optimizing image quality and system performance. Traditionally, technicians often only carried a handheld monitor for aiming and focusing, and little else. In IP surveillance systems, however, this process is more complex, since cameras are network-based, and most do not offer analog output for focusing. Even if the camera is equipped with an analog video output, megapixel cameras can be notoriously difficult to focus via this method. Laptop/Tablet: The first method is to carry a laptop or tablet PC to each camera, physically connecting it at each location to perform setup. The obvious drawback to this is the size/unwieldiness of the PC. Installations at standard ceiling level force the technician to hold the PC while on a ladder, while exterior installs may require this to be performed in a lift. Netbooks and tablet PCs have improved the process somewhat, as they're lighter, and generally smaller, but still can be challenging to manage. Handheld Monitor/Specialized Tools: Common in the analog world, numerous options exist for small CCTV installation monitors, which may be held in one hand or strapped to the forearm. The downside of these units is that they offer only analog video input, no IP capability, rendering them useless for cameras without analog output. Tools such as the Axis T8412 offer similar functionality for IP cameras, however. This unit is a battery-powered handheld device, which supplies PoE to the camera, and may be used for aiming and focusing. It is also capable of taking snapshots from each camera, useful for installation documentation. The downside of this tool is that it only supports Axis cameras currently, making it useless for integrators using other cameras. Two-man Method: The final method, and least convenient, involves two technicians, one at the camera, and one watching live video as the field tech aims and focuses, communicating when the camera is positioned properly. This can be a tedious process, as the least bit of latency can lead to lag in communication, making it difficult to fine-tune views. Unlike other options, laptops may be used for a variety of tasks. They are the only option which allows full access to a camera's web interface, allowing settings to be changed in the field. They may also be used to connect to the VMS server from the field, if changes must be made. In many or most cases, integrators' technicians are issued laptops as standard practice. This makes the laptop a zero-cost addition, unlike other options. Considering a decent laptop may be found for well under $1,000, it is price competitive with units such as the Axis installation display, which sells for over $600 online. Given this pricing, and the fact that it may be used for other tasks, laptops often make the most sense. 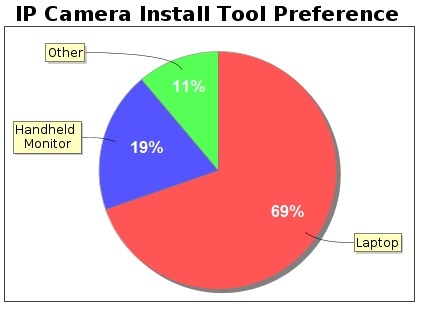 Multiple integrators mentioned strong preference for or standardization on cameras with auto-focus features. Readers may see our update on Auto Back Focus preferences from this survey for more information. With auto back focus becoming an increasingly common feature, we expect that in the next 1-2 years, cameras without it will be the exception, not the norm, which should help to simplify installation somewhat. "Usually laptop/pinpoint combo which is inefficient and cumbersome, or radios back to main server which is slow and cumbersome. Making a big push to use more auto focus capable cameras in our specs." "I really wish all IP cameras had an auto-focus feature, at least for install. More than one of our techs has dropped their device during a focus/aim/setup operation." "We are moving toward utilizing cameras that offer auto back focus and remote auto focus to eliminate the need to stand on a ladder and focus a camera." "Don't like the approach because it is an expensive and clunky way to get the job done. However the laptop is used for other applications, so it all works out." "A bit clunky, especially when working on a ladder and/or in limited space, or in sunlight." "Would like a specialist tool, like the Axis handheld device, but often expensive and at least with a latop you can access the other functions from the web setup at the same time"
"Still trying to find a simple cost effective device with PoE. Auto focus feature on Axis cameras works well and makes the set up a lot easier." "It can be difficult to focus cameras in an exterior environment. We are moving toward utilizing cameras that offer auto back focus and remote auto focus to eliminate the need to stand on a ladder and focus a camera." "A little too clumsy and sometimes they get damaged. However, they can serve multiple purposes so we're still using them." "Seems clunky. The installers use the laptops for other things too, though, so it reduces the number of tools we have to issue." "Technicians don't always do the best job focusing cameras when they are working in cold or wet weather at the top of a pole or ladder. Given some past issues I often wonder if some of our techs' eyesight is even good enough to operate a vehicle." What is most striking about these responses is that, despite a very strong majority using laptops for installation, most respondents also had complaints about using them. However, the advantages of having a full-fledged PC seem to at least partially make up for the size disadvantage. The other key takeaway from these results is that there is a lack of specialized tools for installation of IP cameras. Axis' installation tool has a number of advantages over laptops, but until two things happen, we don't expect to see widespread adoption. First, such a tool needs to be open to multiple camera manufacturers, either through direct integration or, more likely, ONVIF. Second, pricing needs to come down to lower levels. At current pricing, tools such as the Axis unit are priced too close to laptops, while providing only a fraction of the functionality.